The Ballad of Sweeney Todd. Sinister, depraved, monstrous ... true? Was Sweeney Todd a real person, or was he an invented bogeyman? The character has gone from a minor madman in a 19th-century newspaper serial to the melancholy murderer in Stephen Sondheim's beloved Broadway musical. His macabre career as a maniacal frightener of young and old has spanned two centuries, but is it grounded in fact? For generations, scholars and historians have debated the existence of the Demon Barber. 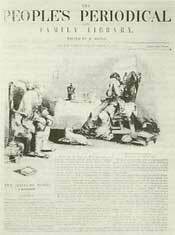 Sweeney Todd's first known appearance in print was in an 1846 "penny dreadful," a type of horror tale of the era published in serial form, The People's Periodical. The razor-wielding barber who turned his victims into meat pies was a secondary character in the short story The String of Pearls: A Romance, written by Thomas Prest. With its bloody killing spree, ghoulish villain and macabre recipe for disposing the evidence, "The String of Pearls" was perfect fodder for the Victorian imagination. George Dibdin Pitt, a hack playwright of the time who commonly purloined other people's ideas, immediately dramatized Prest's story for the stage. Retitling it The String of Pearls: The Fiend of Fleet Street, Pitt advertised his production one year later as "Founded on Fact." The play, set in the reign of George II (the late 18th century), debuted on March 1, 1847, at the Hoxton Theatre, a London "bloodbath" - a theater specializing in sensational melodramas. Ever since, speculation has raged about whether the Demon Barber was man or myth. There are no clear answers. No public records substantiate the existence of a London barber named Todd in the late 18th century or, for that matter, of a barber shop located on Fleet Street. But there were certainly enough bits and pieces of real-life horror floating around at the time, reported in "The Old Bailey" section of the London Times, as well as other daily newspapers. The public had an enormous appetite for all things gruesome and devoured local news accounts of wicked deeds and nefarious crimes. And because news commonly traveled by word of mouth (much of the population was still illiterate), stories of shocking criminal exploits passed from person to person (with probable embellishment along the way) and were asserted to be "true fact." To add to the confusion, many penny dreadfuls were fictionalized accounts of real crimes. And Thomas Prest, the writer who first set down Sweeney Todd's name in print, was known to hunt regularly through newspapers for his story ideas.